Indian Twitter accounts are seemingly under attack. After Congress Chairperson Rahul Gandhi’s account was compromised and hackers hurled insults at him, Kingfisher Chariman Vijay Mallya’s twitter has also been hacked. 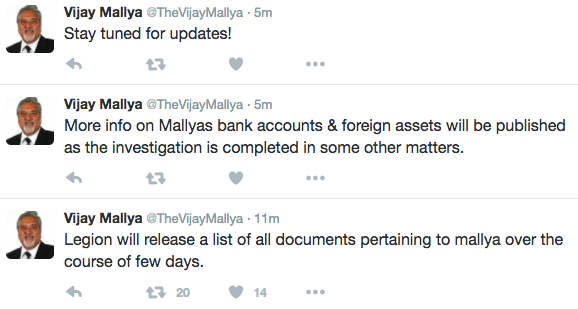 It appears that hack occurred at around 3am last night, and the hackers tried to blackmail Mallya. He tweeted about the hackers, saying they had control of his account. 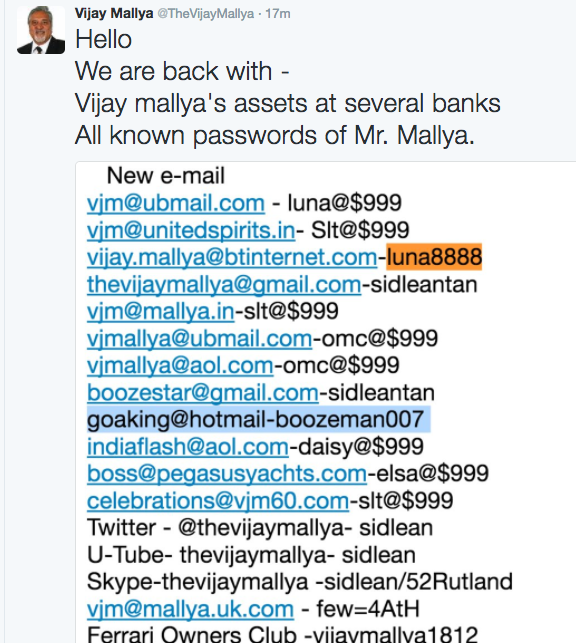 Today morning, the hackers apparently made good on their promise and have shared some of Mallya’s documents, including his email passwords, addresses, and bank account details. The hackers, like with the Rahul Gandhi hack, seem to be internet vigilantes who’re keen on bringing people who they perceive to be “fraudsters and conmen” to justice. Vijay Mallya had caused much controversy earlier this year when he’d defaulted on bank loans worth crores and had fled to England after his Kingfisher empire sustained huge losses. The Indian government has been attempting to extradite him but to no avail. The hackers also threatened to release further updates over the next few days.